After the signing of the record deal with "Warner Brothers", the local communal magazine "Kontakt" of the Østenstad Municipiality writes a title story on a-ha, or rather on Morten (whose father is part of the editiorial staff). The article tells the story of Morten being the Judas in a municipiality play and now has a million-contract with Warner Brothers. a-ha go into the studio and during the next 8 weeks, they record most of the tracks for their forthcoming LP "Hunting High And Low". 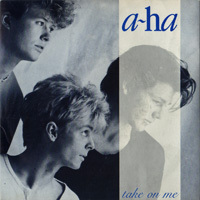 19	"Take On Me" is released for the first time in the UK, it only sells approximately 300 copies world-wide (and only makes it to number 137 in the UK charts). One of the tracks on the 12" is the unreleased "Stop! And Make Your Mind Up". In Norway, a-ha are interviewed on the programme "Ungdommens Radioavis" on NRK Radio. 20	The Norwegian newspaper "Aftenposten" announces the appearance of a-ha on the TV show "Lørdagssirkus" ("Saturday Night Circus") and says that the guys will have a promising future. This is the first time that one of Norway's biggest newspapers has written about the band. a-ha do their first performance of "Take On Me" on the Norwegian show "Lørdagssirkus" to promote their new single. They actually perform four songs (in front of the hosts of the show, Rita Westvik and Turi Tarjem), but the only song featured in the show is "Take On Me". Paul Young is also a guest on this show. 24	There is another article on a-ha in "Aftenposten" which reports that rumours on the fabulous band named "a-ha" have been quite loud for a while in Norway, even before their music has been heard. In an interview the guys reveal that it's good to be talked about, but that the expectations may be far too high. They reveal that "Take On Me" is not a typical a-ha-song and that none of their other songs are "typical a-ha" as they intend to change their musical style very often. Never-the-less, they say that everybody will still hear their songs and know they are by a-ha, but that style and looks are not important to them. "Take On Me" is released in Norway; it goes on to reach No.3 in the charts and stays for 15 weeks in the Top 100. After a-ha's appearance on Norwegian TV, an 18-day long promotion tour of England is planned. 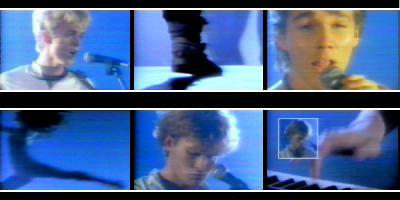 a-ha are interviewed for the first time in the UK on "Sky-Fi Musicshow".